HR and payroll need to think about becoming the workforce skillers of the future according to Sara Caplan from PwC, who was interviewed on HR3’s parent company ReadyTech’s podcast WorkED. It’s a question that will meet with a mixed response from HR and payroll teams. With many employees charting their own course through work and a perfectly good education market providing knowledge and skills, businesses may ask why they need to bear the extra cost of upskilling. 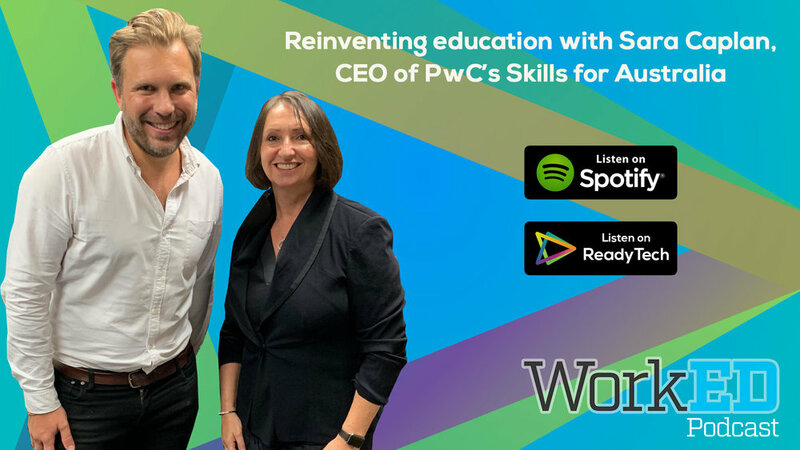 However, in the firstepisode of a new podcast from HR3’s parent company ReadyTech, PwC’s national skills lead Sara Caplan tells CEO Marc Washbourne future employers will need to do more to protect their business sustainability and to ensure they are being a responsible employer. Is reskilling part of being a ‘responsible employer’? With the future likely to make many of today’s skills obsolete as well as creating new ones, Caplan says employers will need to think about what this means for their skilling role in society at large. “I’ve been thinking a lot about the concept of being a ‘responsible employer’, and thinking about the effect on your workforce that is going to be happening as a result of rapid change and how you deal with that. Also, how you invest ahead of the curve so that you know you’ve got the workforce you need, you’ve helped them identify the skills gaps and you’ve helped them fill them,” Caplan says. The vocational education sector could be the future engine for filling theses skills gaps, Caplan says. However, the common factor is the contribution employers will need to make to this effort. “It really has to be a partnership between employers and industry and the education providers to make this work, because we still have a bit of a communication gap between those two parties and they have to come together to work on what are the gaps and how are they going to fill them most effectively and in the most efficient way? Quickly, appropriately, relevant - and training in the way that both the individual and employer needs to do it,” she says. The effort required by employers will be forward-looking and lifelong. While governments and individuals shoulder responsibility, employers increasingly need to do the same, Caplan says. “For example in Singapore they have launched SkillsFuture - which is a program that enables individuals at all sorts of levels to continue to upskill and learn and gives incentives for doing that to individuals, but also to employers to help their employees to do so. There are other programs like that in other countries where they are focusing on keeping people in work through upskilling. It’s both a government priority but also it has to be an employer responsibility,” she says. appears that business has already decided that playing a role in skilling and reskilling does matter to them. In fact, a 2018 Sklling: A National Imperativereport from Australian Industry Group found 52 per cent of businesses intended to increase their expenditure on training, the highest recorded since 2012. This was as a result of an environment in which 75 per cent of employers reported skills shortages - also the highest on record - due to greater challenges finding the skills they need in the market. Businesses in 2018 had placed a high priority on training managers in digital skills. While there is much change to come as a result of technology, Sara Caplan’s view is that - as long as we keep up with reskilling - we won’t all be out of a job any time soon due to AI and automation. “I’m at the end of the spectrum that says we will create a huge number of new jobs that will replace the old. That’s really based on the fact it’s not full jobs necessarily that will be disrupted and taken away - it is the routine manual tasks that can easily be automated. And so what I think we will see is a shift in the types of job roles and new job roles emerging. What it does mean is that people who were doing those sort of routine, non-cognitive tasks are going to need quite a lot of reskilling,” she says. Want to hear more about the future of work and education? WorkED is a new podcast from HR3’s parent company ReadyTech, investigating what the future of education and work will really look like and asking whether we’re ready for it. In conversation with ReadyTech CEO Marc Washbourne, leading thinkers in the fields of education, employment and technology come together to share their personal work stories and challenge the outmoded thinking, business models, community assumptions and policies being reshaped or upended by technology. Sara Caplan has a history advising business and government around the globe. On WorkED, Sara shares her personal journey from studying Maths at university and managing a pub to a career in management consulting at PwC, in order to shed a light on how education as we know it might just need to be reinvented. Highlights include Sara’s take on higher education, the resurgence of VET, and her call for employers to get busy playing a role as the reskillers of the future.